Performers include: Mo’Nique, Countess Vaughn, Dorien Wilson, Jenna von O\u00ff, Ken Lawson, Yvette Wilson, Dwight Woody, Kara Brock, and Paulette Braxton. Years ago, Nikki Parker (Mo’Nique) dropped out of high school to care for her infant daughter, Kim. 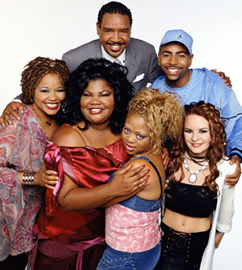 Once Kim (Countess Vaughn) reaches adulthood, Nikki decides to go back to school. She enrolls at Santa Monica Junior College, the same school that Kim attends. Nikki moves into Kim’s apartment which initially causes friction but, as time goes on, the two become close friends. Things are kept interesting by Kim’s offbeat best friends; quirky Stevie Van Lowe (Jenna von Oy) and lothario Thaddeus “Tyrell” Radcliffe (Ken Lawson). Nikki’s voice of reason is her friend Andell Wilkerson (Yvette Wilson) who tries to keep things in perspective as Nikki pursues handsome Professor Stanley Oglevee (Dorien Wilson). The series is a spin-off of the Moesha sitcom which co-starred Mo’Nique.